Create a External Uploader that you can place on your Website or Share with people to upload media remotely to your account. 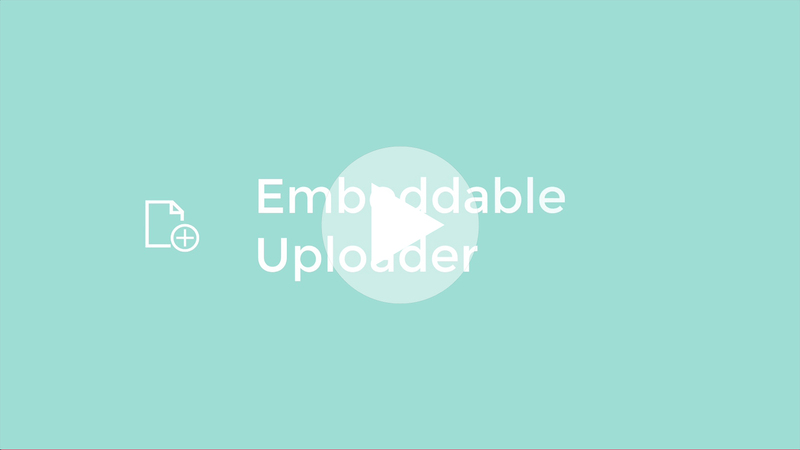 The Embeddable Uploader enables you to create a uploader that can be placed on your website or share via a link directly with colleagues and clients. Users can then upload media content externally to your specified location in your Cloud Media Panel without having to pass on any account login information. 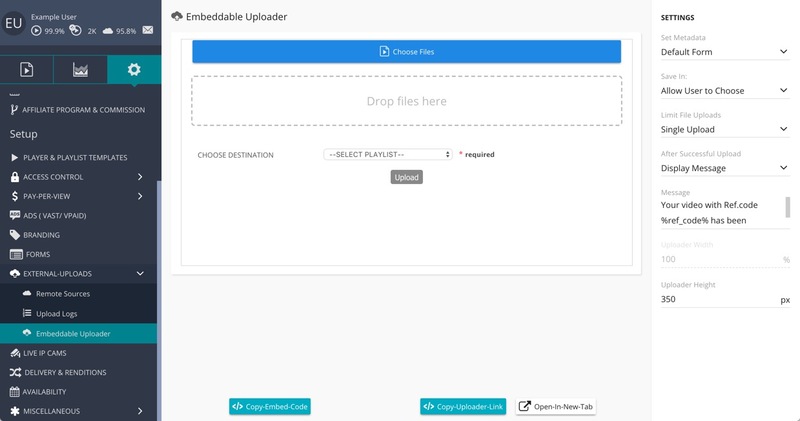 You can visit our Uploaders Feature page page for a embeddable uploader demo and some extra information. Go to ⚙️ Settings > External Uploads 🔽 > Embeddable Uploader. Here you will be presented with a Preview of the Uploader in the Center and the Settings Configuration Panel on the right. Under Set Metadata you can choose the default Metadata Form or select one of you own Custom Metadata Forms. Save In: Here you can set where new media files will be uploaded to. This can be set to Allow the User to Choose or you can also set it to a Specific Existing Playlist. Limit File Uploads: You can set this to a Single Upload or allow the user to do Multiple Uploads at a time. After Successful Upload: Choose if you wish to Display a Message or Redirect to a specific URL when a media file has been successfully uploaded. Message: If you have chosen Display Message after successful upload then you can edit the message displayed here. Set Redirect URL: If you have chosen Redirect to URL after successful upload then you can enter the URL address that the user is sent to once the upload has completed. Uploader Width: This is set to be responsive at 100% by default. Uploaded Hight: You can enter how many Pixel hight you would like the uploader to take on your website. Open In New Tab: This will open the upload in a seperate browser tab for you to see and preview the uploader. Click on the </> Copy Embed Code button to copy the code to your computers clipboard. you can then paste the code into your website editor. You can also click on the </> Copy Uploader Link button to copy a direct link to the uploader without having to embed it to your site. You can share the link directly with your colleagues / clients for them to upload from.